Something might have slipped through the cracks of my RSS reader (or simply I wasn't free to read them these days), that I didn't realized that Gaim isn't there anymore. I went to http://gaim.sourceforge.net/ yesterday night, something that I do occasionally as I've been following the development of the version 2.x, shocked by its new name and the change of look-and-feel. Gaim would become Pidgin, libgaim would become libpurple, and gaim-text would become finch. The name Pidgin was chosen in reference to the term "pidgin", which describes communication between people who do not share a common language. The name "purple" refers to "prpl", the internal libgaim name for an IM protocol. 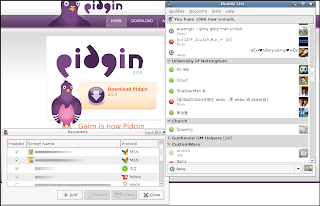 Gaim 2.0 Beta 6 was the last version to be called Gaim, and Beta 7 was the first version to be called Pidgin. The final version was released on the 3rd of May.